The line at Green Eggs and Ham is getting full! This past Sunday, Mar. 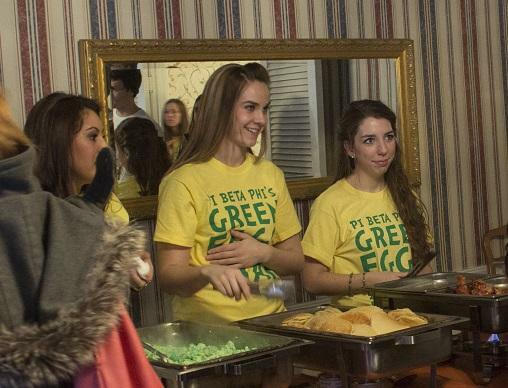 2, the members of Pi Beta Phi opened their house doors to host their annual philanthropic event, Green Eggs and Ham. Students and locals were abuzz with curiosity and excitement upon entering the house, which was aptly decorated with green and yellow balloons and tablecloths. The event featured a photobooth corner where visitors could take photos with The Cat in the Hat. For four hours, Pi Phi members conversed with guests, read them books and most importantly, served them a delicious breakfast for dinner. The breakfast consisted of pancakes, bacon or sausage and of course, green eggs. Visitors paid $3 for one plate of food and $5 for unlimited plates. Although some were wary of the green eggs, many Millikin students and visiting children ate them with glee. No word on whether they would eat them in boxes or with foxes. “The money we raise goes to our Literacy Fund,” sophomore Pi Phi member and event coordinator Marlina Zimmerman said. “We use the money to help with Pi Phi’s philanthropies—First Book, C.A.R., the National Day of Service and the like.” C.A.R., or Champions Are Readers, is a service in which the members regularly visit grade schools and read books (which they provide) to children. Pictures drawn by the students of Cerro Gordo Elementary, one of the participating schools of the program, were featured as decorations in the house dining room. How is this event made possible? Besides decorating and assigning current members with preparation and clean-up tasks, local businesses are contacted to help sponsor the event. The food served was graciously donated by Cracker Barrel and Kroger, while raffle prizes were sponsored by Del’s Popcorn Shop, Mowry Baking Company, and La Gondola. Money raised from the raffle prizes was put towards the Literacy Fund as well.